Suzhou: India put up a stout performance against favourites China in an international friendly on Saturday, holding the hosts to a 0-0 draw. 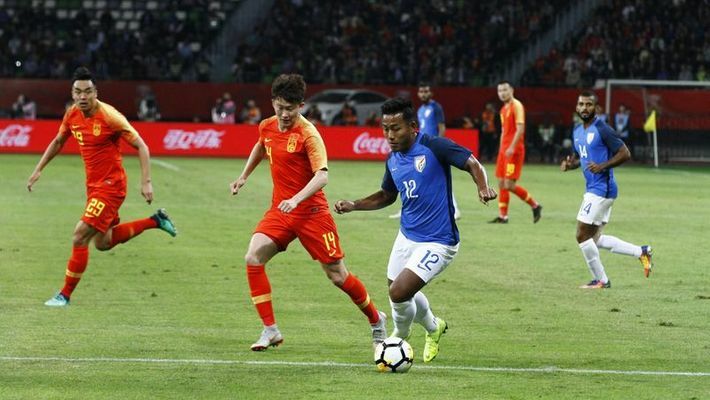 China, who made an appearance at the 2002 FIFA World Cup, and are currently placed 76th in the FIFA rankings could not find a way past the resolute Indian defence. It was the 18th encounter between the two sides. They were meeting for the first time in 21 years and the first time on Chinese soil. The result is a massive shot in the arm for Indian football. India did force a save from the Chinese custodian Yan Junling in the 10th minute. Thapa played in Kotal down the right whose rasping shot was palmed away by the goalkeeper. At the other end, Gao Lin rose the highest in the box before heading across straight to the goalkeeper who held on.